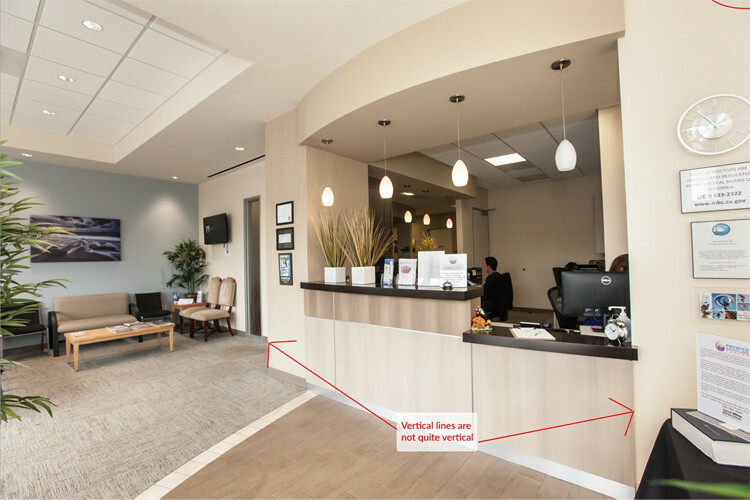 There are many things that set professional architectural photos apart from others. Lighting, angles, sense of scale… all these things come into play. Yet one of the more subtle, yet powerful, qualities that set a professional shot apart is the lines. Specifically, are the vertical lines truly vertical and has any distortion been corrected? Thankfully, correcting distortion is a relatively straightforward process in Lightroom. In this article, I will walk you step-by-step through my workflow for correcting lens distortion in Lightroom. 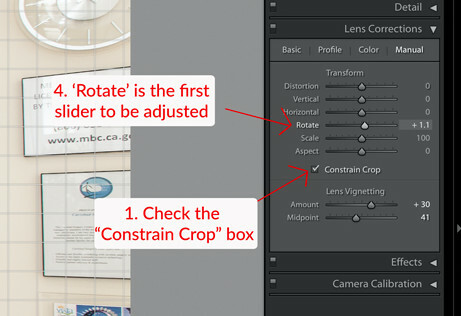 While in the Develop module, scroll down to the Lens Correction section, and click into the “Manual” tab. 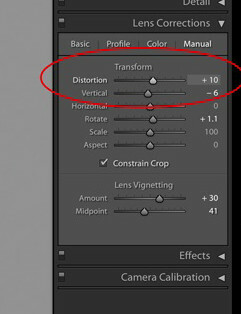 You’ll see a slider for distortion, vertical, horizontal, rotate, scale, and aspect. Let’s take a look at our sample image and see changes may need to be made. 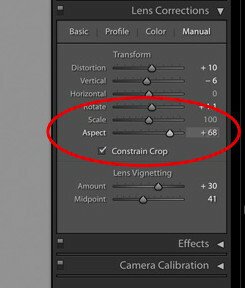 Before adjusting any sliders in this section, be sure to check the box that says “Constrain Crop”. This allows you to make changes without changing the crop ratio, it also avoids creating any empty spaces on the edges of the photo. To minimize the time you take to do your corrections, I always find it best to begin with the rotate slider. For this one, you’ll want to take note of a vertical element in the CENTER of the frame, and rotate until that element is aligned with the grid. Don’t worry just yet about the vertical lines on the edges of the frame. If there isn’t a vertical element towards the middle of the frame, use your best judgment with the nearest vertical line. You can always come back to the rotate slider and tweak as needed. Next, you’ll want to take care of those pesky verticals that are askew. 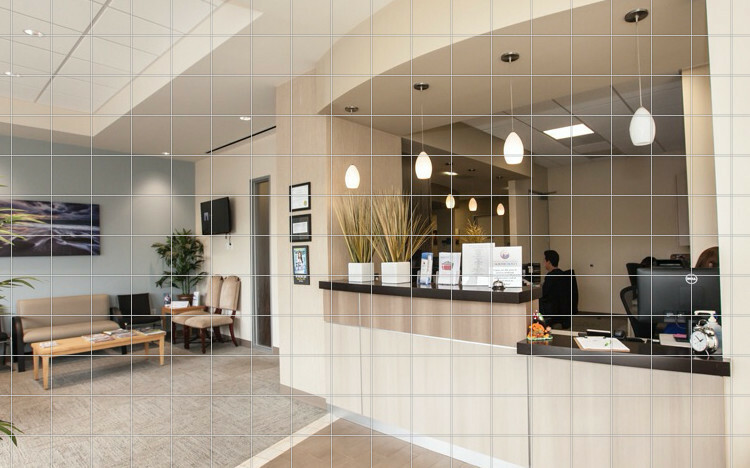 Since your center is already aligned, the adjustments you make on the ‘vertical’ slider will be evenly applied to vertical lines on both sides of the frame. Slowly adjust as needed until they align with the grid lines. If your camera was pointing downward slightly, this means that you’ll want to grab the slider and drag to the right so that the bottoms of the verticals get pushed outward. If the camera was pointing slightly upward, you’ll want to take the slider towards the left so that the tops are pushed outward to compensate. If your camera was completely level while shooting (always recommended! ), then the changes you need to make on this slider should be minimal, if any. The next step will be to look at the distortion slider and adjust accordingly. 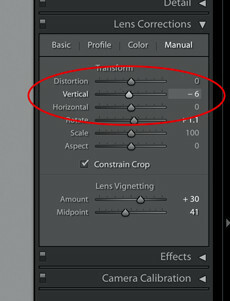 This slider helps with the roundness that sometimes is visible from lens distortion, notably on the edges on the frame. Pushing the slider to the right will squeeze the center of the frame inward, and pushing the slider to the left will bend that center area to the outside of the frame. 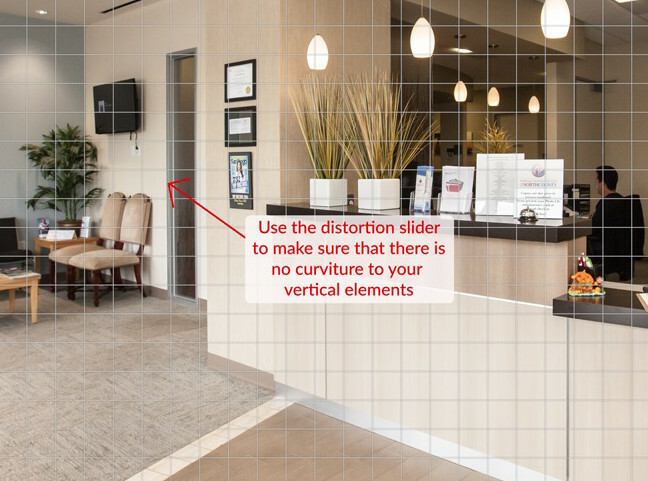 Typically, you’ll need to slightly push the slider to the right to compensate for the wide-angle lens distortion. Again, be sure to use the grid as a guide, and don’t be afraid to go back and tweak the vertical and rotate sliders if needed along the way. Rather than using the scale slider, consider using the Crop tool at the top of the column (to the left of the graduated filter). I find that I have slightly better control, especially if I want to crop off-center. 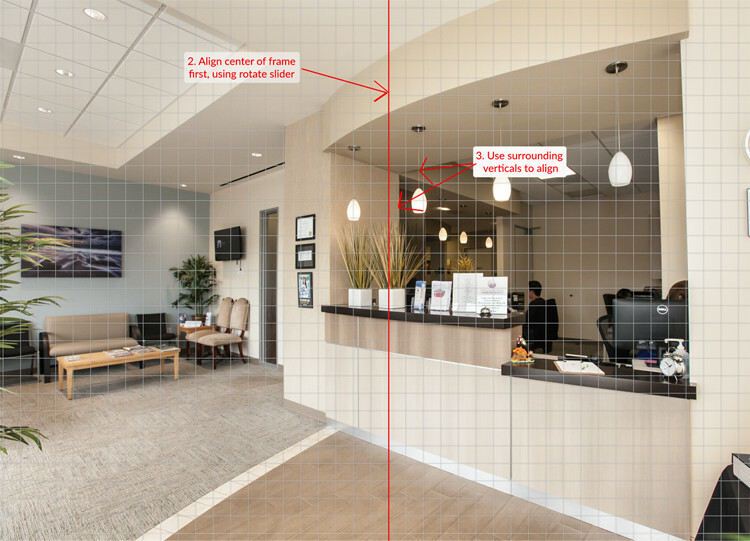 The scale slider will enlarge from the center of frame only, making custom cropping difficult or impossible. 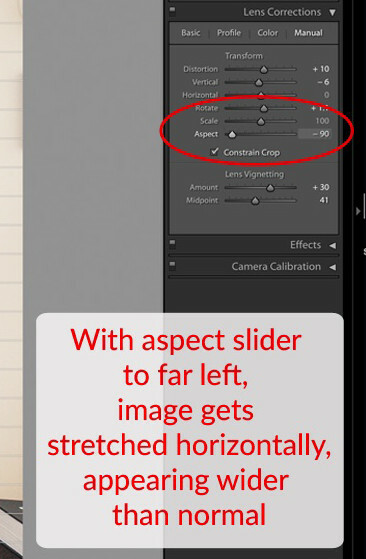 The aspect slider essentially squeezes and stretches your image horizontally. While this slider rarely comes into play for interiors, it can be a great tool to have for exteriors! Sliding it to the right will squeeze the image, making buildings often appear taller and grander. Sliding it to the left will make objects appear shorter and wider. Finally, the horizontal slider is rarely used. 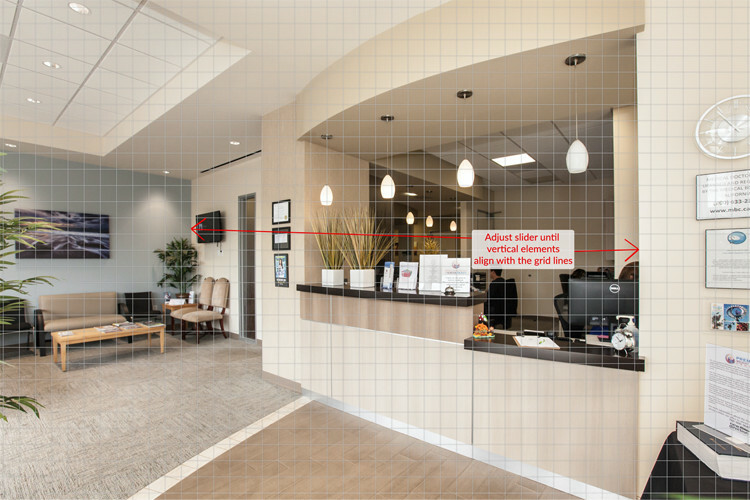 Generally speaking, the horizontal slider applies most when you’re shooting a vignette straight on, and BOTH verticals and horizontals need to be aligned on a grid. This can be a handy tool, but beware that you’ll most likely have to go back and forth a bit between verticals and horizontals to find the sweet spot where it all aligns perfectly. Be careful not to adjust the horizontals too much, as this can cause additional distortion. Typically, verticals take top priority, so adjust those first! 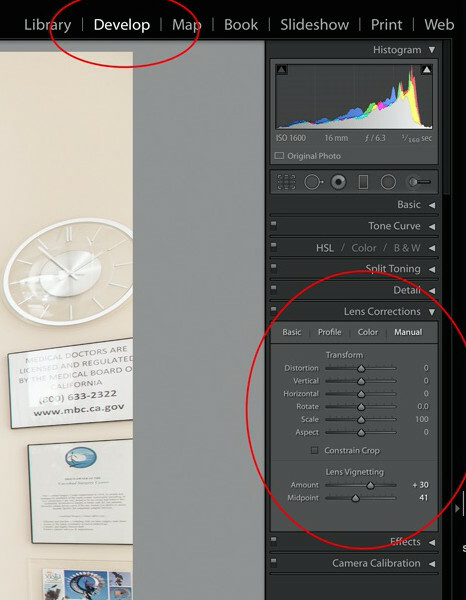 Once you begin to straighten out your lines using the manual lens correction sliders, you’ll wonder why you didn’t do it sooner! With some practice, the adjustments will feel instinctual and necessary. 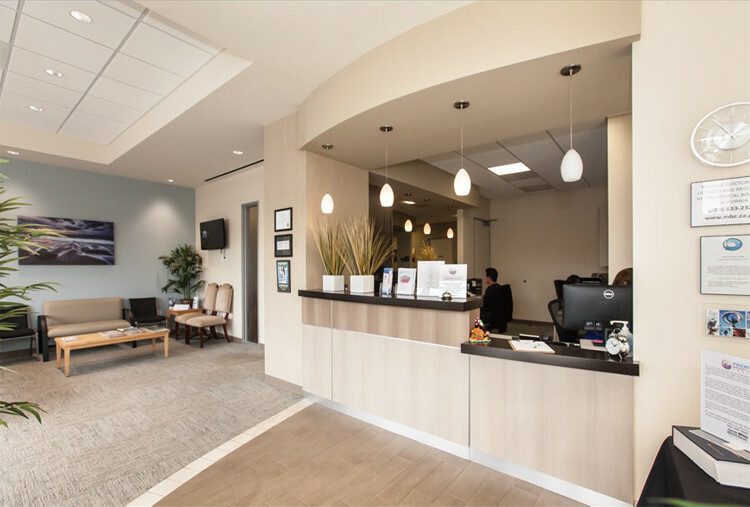 Natalia Robert, founder and lead photographer of Full Circle Images, brings her background as an architectural designer forward to produce luxurious images that create a sense of warmth and culture. Natalia has had the honor of collaborating with various local publications, TEDxSanDiego, AirBnB, and countless small businesses to convey stories through strong imagery. Today, her furry co-pilot, Daisy, inspires a daily sense of wanderlust while serving as a reminder of how valuable it is to maintain a sense of HOME.